The Nutty Nook is cozy 2 bedroom, 2 bath Log Cabin townhome less then a mile from Dollywood & Dollywood Splash Country. VIEW NOW. If you have ever wanted to see the Smokies from a bird’s eye view, now is your chance on the Tree Canopy Walk at Anakeesta! This series of 16 connected sky bridges suspended in the trees allows you to safely stroll 40 to 60 feet above the forest floor. Each of the sky bridges leads to a new observation platform where you can enjoy the spectacular scenery and learn about the surroundings with fascinating interpretive signage. Be sure to be on the lookout for wildlife as you never know when you might see a woodpecker in the treetops or a bear on the ground. Soar through the air like an eagle on the Dueling Zipline Adventure at Anakeesta in Gatlinburg! This amazing attraction features three side by side racing ziplines more than 150 feet above the ground. This allows you to zip along next to your family and friends as you enjoy gorgeous views of the Great Smoky Mountains. During your adventure, you will be able to test your courage at two challenge stations where you will rappel off platforms and experience a controlled descent to a cushioned platform below. Your journey ends with a short downhill path to the mid-station for the Chondola, where you can ride a chairlift or gondola back to the summit for more fun! Experience the thrills of a single rail mountain coaster on Anakeesta’s Rail Runner, which is the first ride of its kind to be built in the United States! The unique single rail allows you to ride lower to the ground than other mountain coasters, which makes your ride feel even faster as you race through the trees. You control your own speed on the Rail Runner so you can choose from a leisurely pace to a lightning fast run down the mountain. The ride starts with 1,600 feet of downhill twists and turns with speeds reaching 25 miles per hour, then ends with a scenic ride back to the top of Anakeesta Mountain. Stay just minutes from all of the action at Anakeesta with a vacation at Acorn Cabin Rentals! We have cabins of all sizes to accommodate your needs, as well as a selection of pet friendly cabins where you can bring your furry companion along for the fun. While staying with us, you can take advantage of all types of excellent amenities including private decks with scenic views of the Smokies, fully equipped kitchens, soothing hot tubs, fireplaces, and more. 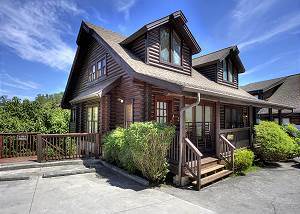 Check out all of our Smoky Mountain cabin rentals today to plan your vacation near Anakeesta in Gatlinburg. We hope to see you soon at Acorn Cabin Rentals!